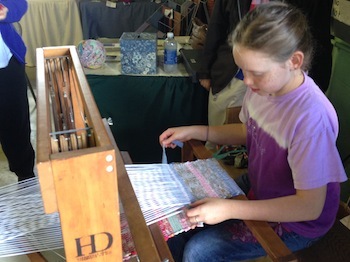 We went to the Shenandoah Valley Fiber Festival in Berryville, VA. Our class is studying the “History of Textiles: Design, Culture and Technology“, and currently have been doing our own weaving on small frame looms. 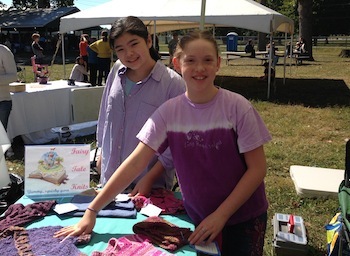 “We saw all kinds of things at the festival. We saw and felt many kinds of fibers, like unprocessed wool from different kinds of sheep called Churro, Jacob, Finn, Corriedale, and Suffolk variety. We saw Angora goats, Cashmere goats, pygmy goats. Alpacas, Llamas, angora rabbits, Emu and even a Camel. Also, we saw flax, cotton, silk and hemp fibers. All are used in spinning and weaving. There were two different kinds of spinning being demonstrated. One spinner gave us a lesson on a wooden “drop spindle”. She made it look easy, first draw the roving, then spin the spindle clockwise until the wool is springy. Then ease the roving out into the springy wool and pinch, then release the twist and this makes new yarn.